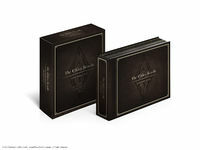 The Elder Scrolls Anthology was a limited-release box set of all five of the primary Elder Scrolls games for PC. It was released on 10 September, 2013 in America and 13 September, 2013 for European regions. A copy of The Elder Scrolls: Arena. A copy of The Elder Scrolls II: Daggerfall. A copy of The Elder Scrolls III: Morrowind and its Construction Set. A copy of The Elder Scrolls III: Tribunal. A copy of The Elder Scrolls III: Bloodmoon. A copy of The Elder Scrolls IV: Oblivion - Game of the Year Edition. A copy of The Elder Scrolls V: Skyrim - Legendary Edition. A single Steam key to redeem Morrowind GOTY, Oblivion GOTY Deluxe, and Skyrim Legendary Edition on Steam. Maps of the game worlds of the five games. This page was last modified on 9 November 2018, at 14:06.